At SRD Roofing, we are committed to providing for the needs of our loyal customers as well as acting in the best interest of the environment. We are excited about the technological innovations that have made it possible to efficiently power your home while helping you save your hard-earned money. Our team at SRD Roofing uses efficient, quality solar roof tiles and shingles for your eco-friendly solar panel roof. Avoid fluctuating and unreliable electricity prices: With rising costs and electricity prices that are difficult to estimate, a solar roof can save you money on your electricity bills. Say goodbye to expensive energy bills with your new solar panel roof. 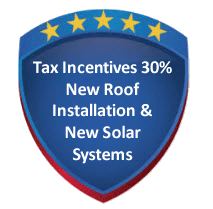 20-25 year guaranteed performance: A solar panel roof can provide you with up to 25 years of performance guaranteed, so you can be sure your solar panel installation is a long term and valuable investment. Create energy independence: No more relying on your utility company. With your solar roof, you are assured energy for your home, without reliance on your utility company. 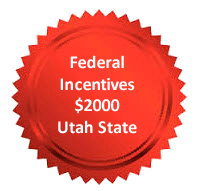 Tax incentives 30% Federal, $2,000 Utah State: Receive tax and cash incentives upon successful installation of your solar roof. 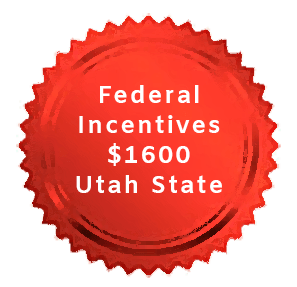 Use this incentive to help pay for your solar panel installation today. Increase the value of your home: Solar energy homes are more and more in demand. 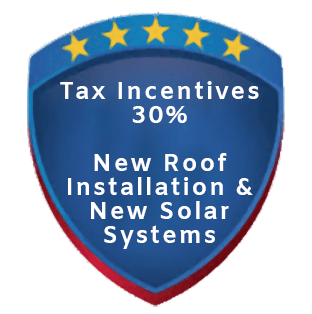 With the installation of your solar panels you can expect the resale value of your home to increase. Save the environment: More people are switching to eco-friendly, energy-efficient ways to create and use energy. Follow the shift to more environmentally conscious ways of living; feel good knowing you are doing your part to save the environment with your solar panel installation. Solar panels offer many benefits to you and your family. Reduced energy bills, reduced carbon footprint and are environmentally friendly. When you are ready to get started with your energy efficient solar solution, get in touch with our experienced team right away. At SRD Roofing, we use only the best solar panel products on the market today. We use high-quality solar roof tiles and shingles, providing a secure, sturdy and efficient solar energy system for your home. To find out more about our solar panel roof products, give one of our experienced staff a call today! Site assessment: Our skilled and experienced team will visit your home to assess your energy requirements, solar panel system design, take measurements and assess your roof. During this time, we are happy to answer any questions you may have and can customize your design and system to fit your needs. Design approval: After your site evaluation by our team, our solar design experts will work with your requirements and needs and get back to you with the perfect design for your home. Permitting: After you approve your design, we send a request out for a permit for your solar panels. 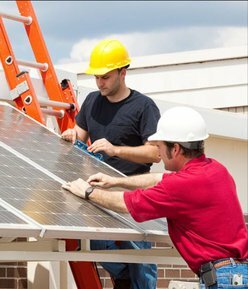 Installation: Once we receive your permit, we can begin your solar panel installation on your home. City/county inspections and utility interconnection: Once the installation is complete, your system can be connected to the grid after going through your city/county inspection. Your documents will be submitted to your utility company and they will install a meter to track your solar power electricity. Begin using your solar power: Once your utility company and your city approve everything, you can start using your solar power! Call SRD Roofing today at 801.919.6700 to start saving!